NEVER thought I’d have to justify a trip to Red Lobster, since I don’t eat ANYTHING that swims (besides canned tuna), but now I have to. Post beach day, I joined a crew on their typical post-beach-day feast at Red Lobster. Bit conflicted here huh? What’s Suaz going to eat? Well, let’s start from the beginning; since I was a virgin Red Lobsteree and all. It’s really just like any other middle-america family restaurant (TGIF, Applebee’s, Uno’s Chicago Grill): big tables, large portions, massive 24 oz glasses, and enough biscuits to turn into one. Started as a 30 min wait for a 7 seat round- which we waited out by the bar, with the very nice and simple bartender. Once seated, I had a chance to glance over the menu- whoa. 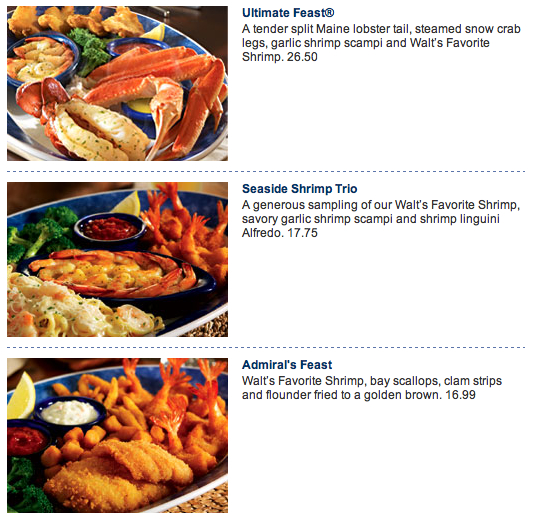 If you’re a virgin Red Lobsteree too, check out the menu>>. 2. Specific question regarding meal- if necessary. 3. Side of broccoli, home-style mashed potatoes, wild rice pilaf, baked potato or fries seasoned with sea salt? 4. Salad Garden or Cesar? …and going down the list above: side of broccoli, and a garden salad with balsamic dressing- and water, water, water. Which BTW- I kept having to ASK for. Guess it isn’t as easy to refill as the biscuits; ridiculous. 2. Reading the word “accompaniment” on the menu. Which as far as I knew wasn’t a word pertaining to food or a menu. LOL- Why not just SIDES? They just tryna be fancy :). OVERALL– not as dreadful as I thought it’d be. Would I go back? Probably not, mainly because I don’t eat seafood. But, to each his own and I’m sure it’s the best place to many family’s out there!